Very good and well written account of Van Halen’s rise. You get an insight into the band that you won’t find anywhere else. Well worth a read! 4.0 out of 5 starsGood read but very sad. I am a huge fan of the original iteration of Van Halen, and have been so for 30 years. Unfortunately, I was too young to see them in concert during that era. Anytime I can listen to live recordings from that era or read about their dominance of rock 'n' roll from 1978 thru 1985, I do so eagerly. So when I heard about this book being published, I pre-ordered it as soon as I could, and started reading it as soon as it arrived on my doorstep. I thought this book was a good read, and I learned some new things about Van Halen. I always knew DLR was a narcissistic egomaniac, and that the VH brothers had hard fought lifelong battles with alcoholism, but this book surprised me with how deeply Alex/Edward spiraled into their addictions, or just how much Dave became full of himself to the point that he was downright mean and intolerable to be around. Reading how the three of them treated bassist Michael Anthony broke my heart. I don't think Noel Monk had a bone to pick with the band, nor do I think he set out to seek revenge for what he went through as the band manager, but I do think he felt betrayed by Van Halen after all the hard work he put in as their manager for 7 years. I think he did his best to be as matter-of-fact as he could about his time with the band, and while he pulled no punches, there was some bitterness to his tone. I've read DLR's autobiography (twice), along with Van Halen Rising and Sammy Hagar's autobiography. I would say this one is as good as the other three. 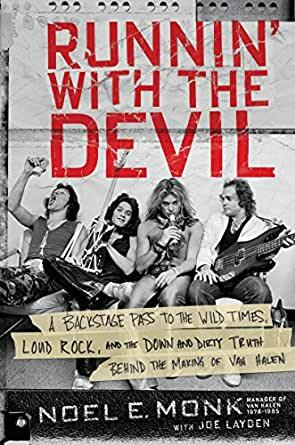 It's a bit more gritty in its details about the VH brothers' addictions than SH or DLR's autobiographies, and it wasn't as detailed as Van Halen Rising, but it does a great job of portraying what happened between 1978 and 1985. I do wish he would have present for and been able to write more about the recording of 1984 and the prior albums. If you want to view Van Halen through rose-colored lenses, and just appreciate greatness of the DLR-era albums (except Diver Down), then don't read this book. If you want an honest behind-the-scenes look at the rise and fall of the one of greatest rock 'n' roll bands of all time, then read this book. 148 people found this helpful. 4.0 out of 5 starsFormer tour manager's band-insider's view into Van Halen's first seven years. The author, Noel Monk, was the tour manager for Van Halen during their years of (IMO, of course) peak creativity and impact during the original David Lee Roth years. If you're looking for some no-holds-barred stories giving insight into the personalities of the four band members, then this book is about as good of a source as I've ever read. One thing I've always wondered about is why have the Van Halen brothers been so plagued by decades of serious substance addiction? This book offers the most meaningful insight into this I've read, and it's really quite sad and at times difficult to read. Nonetheless, it's real, and I believe the author wrote about this about as respectfully as one can. The author was honest from the beginning about his having no access to the creative process of writing and recording, and I was personally glad that he offered this caveat, so I wouldn't have any disappointment, because I'm quite interested in such things. There were portions of the book that I didn't personally care for, such as the author's iron fisted dealings with merchandise bootleggers. Sure, this was his job as tour manager, but all of us have parts of our job that aren't really interesting to most others, but I guess he had some pages to fill. Overall, however, I'll rank this as one of the better I was there rock-n-roll memoirs I've read. I never knew the band was worried about the sales of "Fair Warning" or that Michael Anthony was cut out of the writing credit royalties for the "1984" album. Monk was quite outspoken in his dim view of this happening to Anthony, and I personally like and appreciate an author who speaks the unvarnished truth according to himself. In short, if you're a fan of the band, especially the Roth years, you should find this a thoroughly enjoyable read. Honestly, nothing earth shattering here for most true Van Halen fans. And in fact, it's just another case of a band disintegrating under the weight of drugs, drink, pettiness and clashing personalities. Unfortunately for true VH fans it goes completely against the grain of camaraderie and the rolling 24/7 party that we all wanted Van Halen to actually be or continue to be I would say. Especially considering the treatment of Michael Anthony. Noel's book makes for an easy and entertaining read. And really who cares if Noel presents himself as a great manager. His book, his view. Further given the fact that the brothers or Roth never pursued lawsuits against him (pretty standard in the music business when bands and managers spilt), that he consistently made the band money speaks for itself, that in fact Noel was a great manager. Well done, Noel. The last paragraph of the prologue says, "I find myself smiling. This is the moment, the one that makes it all worthwhile; a moment so pure and joyful--so quintessentially rock 'n' roll--that I feel lucky to be a part of it." The prologue is written around a VH concert in 1982, and it grabs you. I mean it GRABS you! Reading just this one chapter will pull you Van Halen fans in so thoroughly that you won't know what hit you. It did me. I've read David Lee Roth's autobiography, and many others that talk about the Van Halen juggernaut and era. This book is one from another point of view; one of their manager Neil Monk. And it is exhilarating in my opinion. It's a well written book and tells the VH story from a perspective you are likely not have heard before. It got me excited about Van Halen all over again. I'd love to read a book someday written by their manager from the Sammy Hagar days. This one by Neil is unabashedly about his time with the original VH, the David Lee Roth days. If you're even remotely a VH fan, Buy This Book! You won't be disappointed!